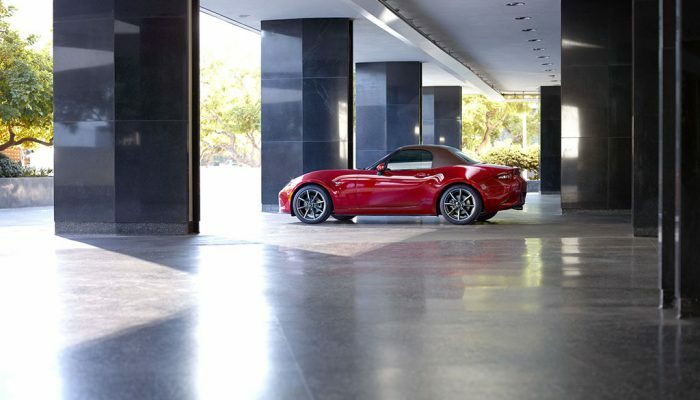 Sports cars represent driving pleasure in its most passionate form, and the Mazda MX-5 has helped bring ear-to-ear grins to more than one million enthusiasts around the world since 1989. It also happens to be one of the best looking (and driving) at any price. Somehow, Mazda managed to design the little two-seater to be reasonably easy to get in and out of. 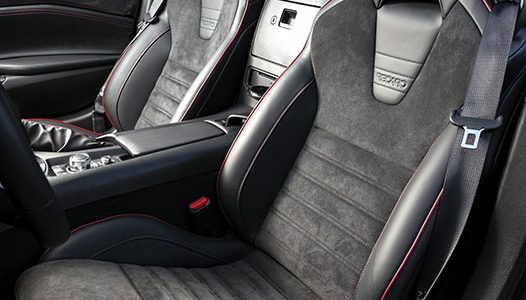 The seats are more comfortable than you might expect and bolstered in a way that won’t make you feel squeezed. A new-for-2019 tilt-and-telescoping steering wheel helps drivers better adjust themselves relative to the shifter and pedal locations. 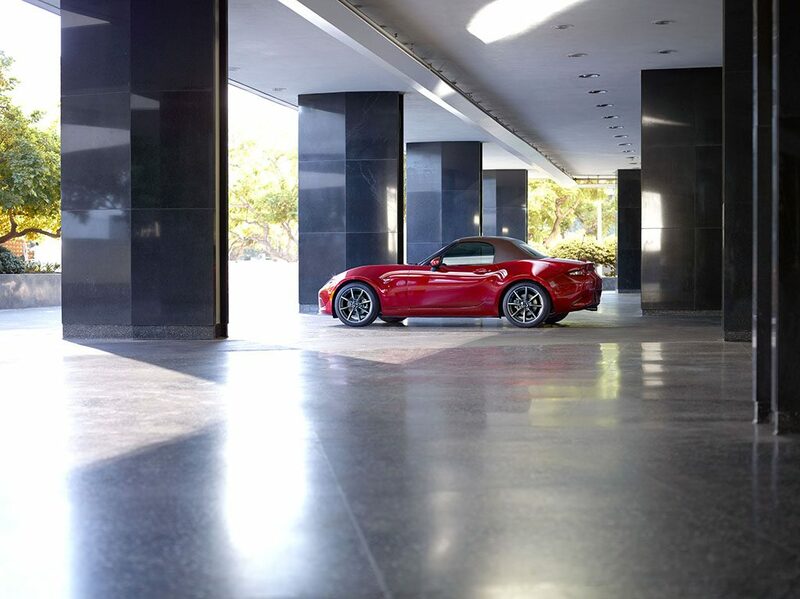 For top-down driving, the MX-5 gives you two choices. The soft-top model’s lid can be easily unlatched, lowered and locked down manually, while raising it does require a bit more dexterity. Mazda has done a good job of sealing the top from and elements while keeping wind and road noise to at least a dull roar. 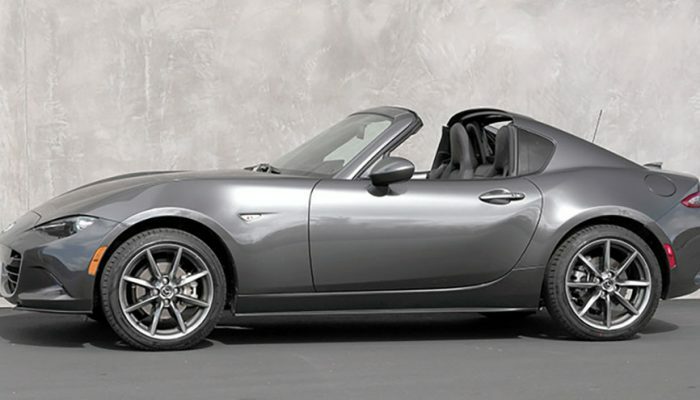 Opt for the coupe-like MX-5 RF (Retractable Fastback) and it’s a whole new ballgame. This version lends an element of sophistication to an iconic sports car that originally shunned such excesses. The two-section top folds and drops in behind the seats in a power-operated ballet that involves briefly raising the rear roof portion. Once the lid is stowed, the remaining roof drops back into place. The driver can monitor the process from the left-side gauge pod that live-streams the action. The end result, though not technically a convertible, is nonetheless open-air stylish. The RF is also the kind of car that will tempt you to drive it year-around, fitted with the appropriate tires, of course. Whatever the season, the only word of caution has to do with the blind spot created by the wide roof pillars. Fortunately, a blind-spot-warning system is standard equipment, but the side mirrors should always be properly adjusted. The 2019 model, while not new (the MX-5 was completely updated for 2017) does receive one significant improvement. 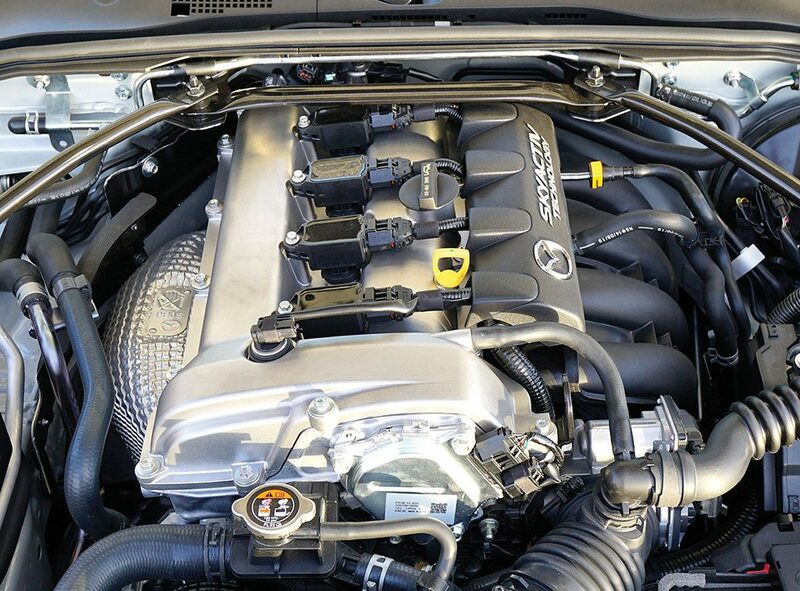 The standard 2.0-litre four-cylinder engine now makes 181 horsepower, which is an increase of 26, or 17 per cent. Torque has also been increased to 151 pound-feet from 148. Peak power comes at 4,000 rpm (previously 4,600) and the maximum rev limit has been upped to 7,500 revs per minute from 6,800. 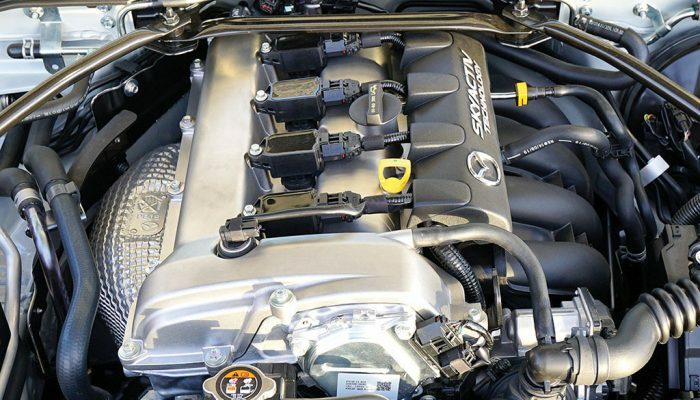 To generate the extra output, Mazda redesigned the engine with lighter pistons and connecting rods, and installed higher-pressure fuel injectors, to name the key changes. The power increase is noticeable from the moment first gear is engaged, the gas pedal is pressed and the 1,065-kilogram MX-5 takes flight. Overall ride quality remains smooth, despite the low-profile tires and the very short distance between the front and rear wheels. Buyers can choose from a six-speed manual transmission, or available six-speed automatic. The manual’s shift quality is precise as is the clutch engagement (pro tip: go with the manual gearbox, even if you must enroll in driver’s ed to master its operation). Combined city/highway fuel economy is 8.1 l/100 km with the manual transmission and 7.9 with the automatic. As good as the MX-5 is, there are areas to be improved upon. The cup holders are positioned so far out of the driver’s reach that grabbing for your quad pumpkin-spice cappuccino while zooming through the countryside is almost impossible. Additionally, the lack of a glove box, or even map pockets on the door panels, seems odd. 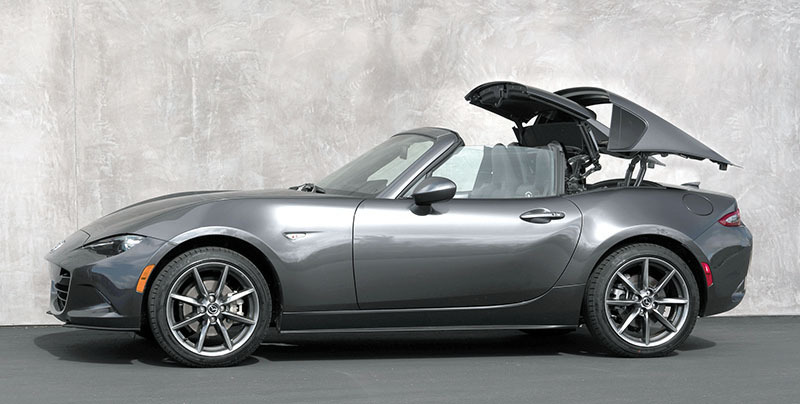 At its core, the Mazda MX-5 is a fun, fashionable, beautiful and highly exhiliarating machine. The soft top starts at $34,800 ($41,800 for the RF), including destination charges, which is something of a bargain. Of course there are numerous price-inflating options and packages available, but at least the smiles the MX-5 provides some at no extra charge. Market position: The MX-5 and the Fiat 124 Spider (Mazda and Fiat co-produce the cars) are the least expensive roadsters on the market. They cater to buyers who tend to treat them as hobby cars, rather than daily drivers. Points: Good looking with the top up or down.• Upgraded powerplant is noticeably friskier than before. • MX-5 and a manual transmission make a perfect partnership.• Sharp interior styling, but could use more stowage space (glovebox). • Watching the RF top stow away is a mesmerizing experience. • You don’t need many bells and whistles added to this car. L/100 km (city/hwy) 9.0/7.0 (MT); Base price (incl. destination) $34,800. Considering how small the MX-5 is, the interior is shockingly roomy. 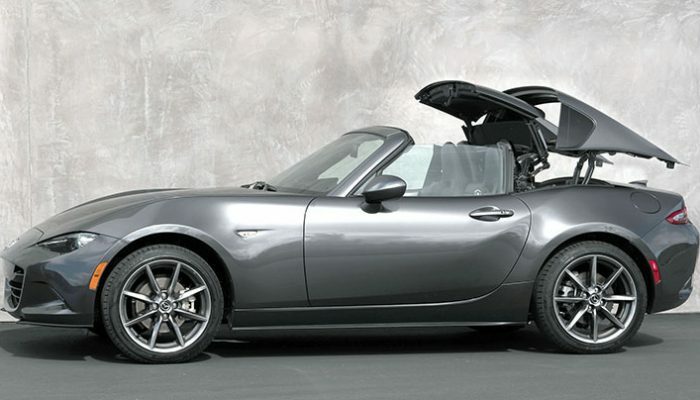 There’s little in the Mazda MX-5 that isn’t absolutely necessary for driving, which is good, because it’s small. While there’s an automatic transmission available, the six-speed manual provides the most enjoyment. Closely linked to the MX-5, but uses Fiat power. Abarth model gets a bit more h.p. More potent and pricier than the MX-5. The 370Z coupe costs much less. The 205-horsepower coupe is seriously fun to drive. No roadster version is offered.